When I started photographing in the mid-seventies, zoom lenses were rare, big, and expensive. My first SLR was a Konica, they had maybe thirty lenses, and three of them were zooms. What people tended to get was a 50mm lens, a 28mm, and a 135mm. Which was a good and handy range, and gave you good quality. Prime lenses (fixed focal length, no zoom) still have many fans, for good reason. It is obvious that it is much easier to make a sharp and compact prime lens than it is to make a similarly good zoom which has to have twice as many elements. You'll never get the same quality for the same weight, size, and price. And for for planned, static work where the very best quality is required, I still use prime lenses. However times have changed. When Hasselblad made their very first zoom over twenty-five years ago, and people asked: "is it as sharp as the primes?" the answer was: "it can't be, obviously." But these days... I have many lenses for my Nikon SLRs and DSLRs, and the two sharpest ones I have are both zooms. (The 17-35mm and the 70-200mm VR.) The hitch is that those two lenses are three times as expensive as a normal consumer zoom, and they are also almost three times as big and heavy. Enter the superzoom. Typical range: 18mm to 200mm. That's a huge range, you'll notice it is longer in both ends than the three lenses I bought back when. And they tend to be very compact, much smaller than the 70-200mm VR I have. So what's the downside? Well, they are not as fast as some lenses, and they are not the world's sharpest lenses. But are they sharp enough? 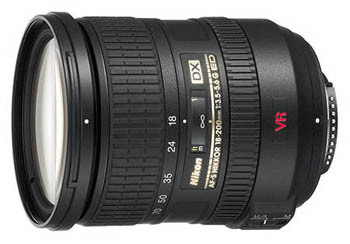 I agonized over this for days before I ordered one of the new Nikkor 18-200mm VR zoom lenses. I poured over reviews and image samples on the web. A lot of "pixel-peeping" as the term is now. I finally decided that it was probably good enough. I was not 100% sure. Actually I almost cancelled the order once, while waiting for it to arrive (it is very popular indeed so it took a couple of months). But then it suddenly arrived at my door one day, and it was too late to cancel. Good thing, because I immediately fell in love with it. Having never worked with a long zoom range before I had no idea what freedom it gives. Who needs to change lenses when you can go from 28mm (equivalent) to 300mm (equivalent) in one twist of the zoom ring? It is amazing. For a "walking-around lens" it is just unequaled. Yes, with two zooms you can just change the lens. But how many times can you do this per hour before you get tired of it? And how much dust will get on your sensor when you have done it ten times? I actually felt that it freed me up creatively. I was quite surprised. But how about the technical compromise? Am I not disappointed with the image quality of the final images? As it turns out, not at all. This lens is weakest at full aperture and at wide angle. (Some say it's weakest at the long end, maybe it varies.) But even at those settings it is not bad. (It can have color fringing, and sometimes the corners are soft.) If you make, say, a 30cm X 40cm print (12x16 inches) with these settings, I will bet anything that nine out of ten people you show the print to will be really impressed with the quality. And the last person will be a hobby photographer who is really hung up on ultimate fidelity. And who cares about him, do you think he will buy a print from you? :) Personally I have no compunctions in using these for exhibition prints. And at the best settings, stopped down two stops, this lens is very good. And the image stabilization is a great boon as well. What Nikon calls Vibration Reduction, or VR. It really does permit you to handhold pictures at two to four stops slower than normal. It is pretty incredible. I have taken sharp pictures at 300mm (equivalent) at 1/30 second! Inconceivable with a normal lens. This means that even though the lens is not the fastest in the world (F3.5-5.6), it is very usable indeed for all-round work in all kinds of light. I feel like a weight has been lifted from my shoulder. And it has. About a kilo, or the weight of one-and-a-half zoom lens, big ones. The two pictures above show both the quality of the lens and the range of it. I am able to change between long tele and wideangle in literally one second. During this walk, I used the whole range all the time!